The war memorial now stands where the original water tanks once stood in the centre of town. This memorial was shipped from Perth and erected in 1923 to serve as a reminder of the tragic loss of life in the Great War, plaques representing the losses of life in the Second World War, Korea and Vietnam Wars were added later. The wall of remembrance erected at the war memorial was unveiled on November 23rd 1991 to commemerate the 50th anniversary of the sinking of HMAS Sydney II by the German Raider, the Kormoran, off the shores of Carnarvon in 1941, in memory of the greatest single Australian maritime loss of lives during the Second World War. 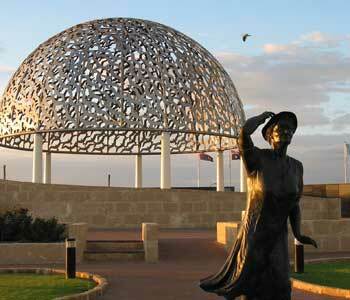 HMAS Sydney Memorial Drive was built in 2001 on the 60th Anniversary commemoration of the sinking of the "Sydney". 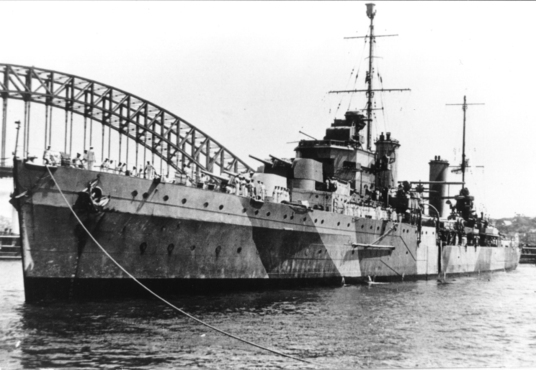 HMAS Sydney II was sunk off the coast somewhere near Carnarvon by the German Raider "Kormoran". On November 19th, 1941 somewhere west of Carnarvon the light cruiser H.M.A.S. Sydney encounter what appeared to be a foreign merchant ship. As the Sydney approached the ship she signalled that she was the Dutch merchant ship Straat Malakka. The Captain rather than deploy the spotter plane to identify the ship, chose to approach to within point-blank range. When Captain Joeseph Burnett of the Sydney requested the ship hoist her secret signal, the merchant ship hoisted the German Ensign revealing that it was not a merchant ship but the German raider the Kormoran. A battle ensued with the Sydney being struck by a torpedo within minutes of the battle, she was however able to hit the Kormoran three times. The battle would end with both ships sinking, 300 men from the Kormoran made it to shore but unfortunately all 645 souls of H.M.A.S. Sydney II perished. The Memorial Drive has 645 plaques & palms representing the 645 souls lost on HMAS Sydney II on that fateful day in November, 1941.There is another HMAS Sydney II Memorial in Geraldton which is well worth visiting.